Algae blooms in Lake Erie, one of the five Great Lakes in North America that borders Canada, Ohio, Pennsylvania, New York and Michigan and contaminated Toledo, Ohio’s tap water to a scary point. Phosphorous and nitrogen from farm runoff, livestock runoff, and sewage systems make the algae in this lake bloom, it’s also a shallow, warm lake that also contributes to algal growth. On Saturday, August 2nd, 2014, the City of Toledo put an alert warning people not to drink or bathe in the water from the city water supply which affected about 400,000-500,000 residents. The toxin is called microcystin which is produced by the algae microcystis. This toxin causes skin rashes, may result in vomiting and liver damage if ingested. 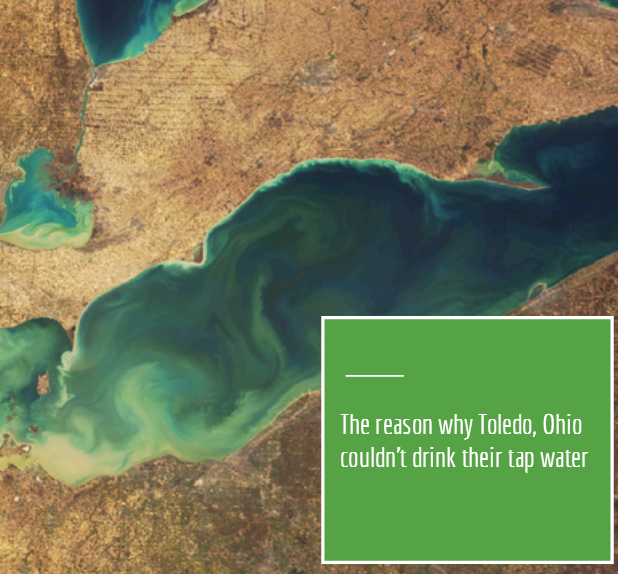 The U.S. EPA and the Ohio EPA showed that the toxin returned to safe levels just a few days later but the issue is “too close for comfort” according to the Toledo Blade.